The onetime network of Cheers wants to drink to that again. Except that Ted Danson’s womanizing Sam Malone can’t get a liquor license anymore. Nor would Cheers’ all-white cast get a pass. In NBC’s notably diverse Abby’s, the bar owner is a proudly bisexual Cuban woman and Marine Corps combat veteran whose manager is of Iranian descent. And if you’re looking for a Norm Peterson, you’ll find him in the demonstrably more plus-sized James, who is African-American. 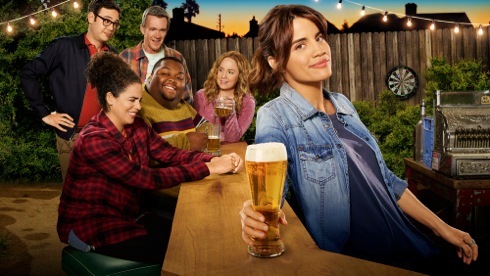 Heading the cast is Natalie Morales, whose Abby’s bar is located in her San Diego backyard. It’s a regimented place of rules and realness, with regular patrons required to earn their assigned barstools by conducting themselves like responsible heavy drinkers. Abby’s veteran top earner is Fred (durable Neil Flynn from The Middle), who gets the opening lines in each of the first three episodes while sporting his former character’s trademark flannel attire in Thursday’s premiere. The designated interloper is bespectacled Bill (Nelson Franklin), nephew of Abby’s newly deceased landlord. Fresh from a divorce in which ex-wife frisked him of virtually everything, nerd-ish Bill is aghast at discovering what he sees as an illegal watering hole. So of course he wants to shut it down before prototypically coming to his senses before Episode 1’s bar time. Abby’s means everything to Abby, with regulars Beth (Jessica Chaffin) and James (Leonard Ouzts) likewise lost at sea without its inexpensive drinks and camaraderie. Manager Rosie (Kimia Behpoornia) wouldn’t know what to do with herself either in a sitcom that so far doesn’t stray beyond the confines of the bar, its ad hoc parking lot and Abby’s adjacent home. Some of the jokes in Abby’s manage to go down easier than the spiced vodka. But too many of them don’t, including the spectacle of Bill being crowned “Tuna Pope” as a means of sealing his sense of belonging. Unlike Cheers, the newcomer has inclusiveness going for it. But the writing is no match at all. In that sense, Abby’s is like San Diego’s reliably nondescript Padres going against the reigning world champion Boston Red Sox, for whom alcoholic Sam Malone pitched before heavy drinking cut his career short. In that context, look for Abby’s to have a short run while its featured booze hounds need not worry about being cut off.